"I discovered this dish at my mother-in-law's house during a family holiday buffet. Her being Japanese, she had many friends who brought wonderful Japanese dishes, and this was and has remained one of my favorites. It's light and fresh any time of the year." Substituted plain green beans for Japanese edamame soy beans. However, mine turned out a little salty, so I think I will cut back on the soy sauce for next time. Very easy and delicious. Everyone at Thanksgiving dinner loved it. 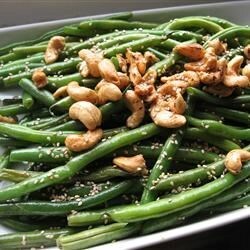 You can substitute asparagus for the green beans and sliced or slivered toasted almonds for the sesame seeds. Very good! A nice change from same old green beans. Be sure to use regular soy sauce as the mild lower salt left them a little boring. very good recipe. added 3 cloves of garlic when sauteeing as well as red pepper flakes for some heat. thanks! Delicious! I added roasted red bell pepper for an added kick!